Are You feeling … purple … red … orange … or perhaps … Blue? but it is also the colour of a very specific mood and is attached to this mood in a way no other colour is – ‘I’m feeling a touch purple; ‘I’m feeling a tad red’; ‘I’m feeling somewhat orange’ – none of them work as well as Blue. One can ‘feel green’, but that reflects a physical rather than an emotional state. You can have dark or black or grey days, but we only ever really feel Blue. Feeling Blue has seeped through our language to colour a variety of settings and situations, but they all have one thing in common – they are to do with the down side of life. Having ‘the blues’ refers to – feelings of melancholy – low spirits – the loss of one’s emotional way – a weariness of the soul. ‘The Blues’ is the name of a particular genre of music, stemming from the musical traditions and life experiences of African slaves in the USA’s Deep South. ‘Blues’ music incorporates blue notes which are flattened notes – The Blues is not created to cheer us. The ‘baby blues’, experienced by women following childbirth, is a period of depression which can range from a few hours of tearfulness to post-partum psychosis. It is not wholly clear why Blue came to hold this very particular position. One suggestion is that it derives from naval signalling tradition. When the ship’s captain died during a voyage, a blue flag would be hoisted and a blue line painted around its hull to signal the loss. 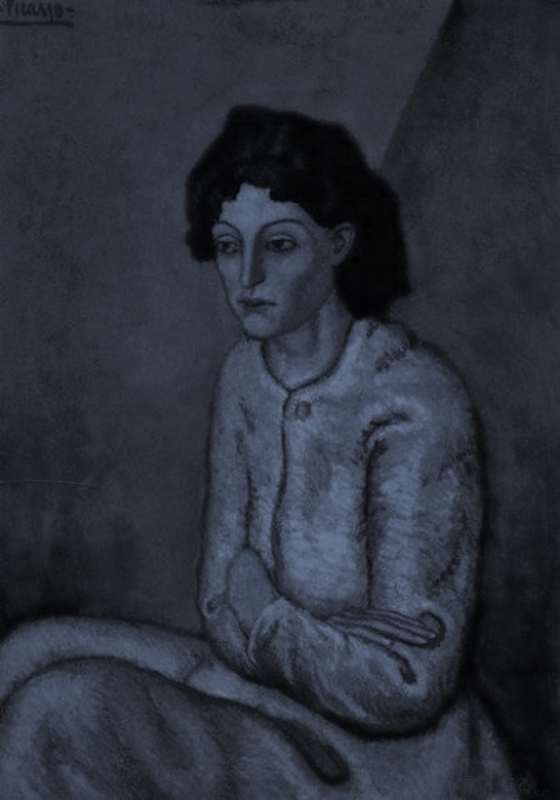 One artist particularly associated with blue and its emotional connotations is Picasso and the art works of his ‘Blue Period’. These were created by Picasso during an emotionally turbulent time, following the suicide of his best friend. Through the use of blue, he communicates something which is often inexpressible in words – that all-pervasive feeling of depression. I am not aware of any other artist who has a highly specific series of works encapsulated by a colour quite to this extent. You would think painting it in monochrome would have the desired effect, but blue is more nuanced. There is something about blue which tends towards wistfulness and melancholy. Exposure to a blue environment is scientifically proven to reduce a person’s metabolic rate. But the calming side of blue can become the cold, isolated side of depression. When the life-force is under threat, bodies turn blue due to a lack of oxygen in the blood. This Blue is the life draining out of us. Blue can make us feel cold, lonely and vulnerable. There is a haunting quality to it that other colours such as black or grey don’t quite manage. My last post was about how we can’t touch the blue of the heavens and the oceans. 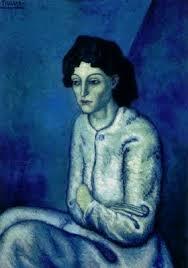 Perhaps that is why blue is also the colour of melancholy – because we can’t touch that either. Just as the horizon can never be reached and the blue of seawater can never be captured, so depression exists in the realms beyond our intellectual and physical grasp. Whether attempting to express the unutterable spectre of depression or inviting us to imagine a world beyond, Blue retains its Awe-Full Mystery. Blue, blue, my world is blue. Blue planet – why blue? What makes the sky blue? Why not orange. 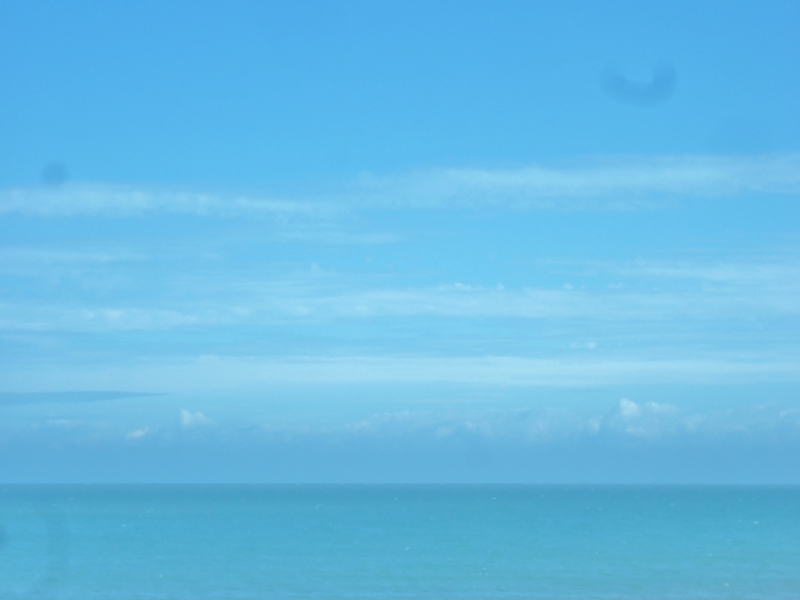 And the sea is blue because it reflects the sky? That’s fascinating about the death of the ship’s captain. I think the associating of blue with depression is an interesting one but I’m more with Churchill and the black dog myself! Or maybe that should be a grey dog. That feeling of being overcast. Depression seems to be something that removes colour. I remember a few years after my mother had died looking at a set of traffic lights and asking a friend if the red light was particularly red. It wasn’t; it was just a sign that the grief I felt was starting to lift. I hadn’t noticed that it had effected my colour vision. Interesting point, Caroline. My view is because blue is calming. If the sky were always orange, I think we’d be a bit exhausted. Similarly if all the green of nature were red it would be most unrestful for the eye – that was in my 26 March blog. They are all so fascinating these colour conundrums! Thanks for being part of the discussion! What a great point – thank you, Victoria! I agree about depression removing colour. Everything does seem black or grey – but I really do think we feel blue. Feeling blue is cold, lonely and vulnerable in a way black isn’t. Black is more of a sledgehammer. I think because of the way the body reacts when deprived of heat or oxygen, the fact that it turns blue, means we associate blue with deprivation, with life dripping away. There is a haunting aspect to blue which few colours possess.